The bkr Ben Glass Water Bottle was inspired by the feeling of always missing London, indulging in excessive fashion, keeping the right pace and weaving your way around the concrete jungle’s controlled chaos like you've lived there for years and the escapist day that takes you through a dark and sinister mood to a beautiful fairy tale. Love this water bottle. I am definitely drinking more water since purchasing it. This glass bottle is great, I've dropped it onto pavement getting out of my car and it never broke. Easy to clean and holds a lot more water than most glass bottles. 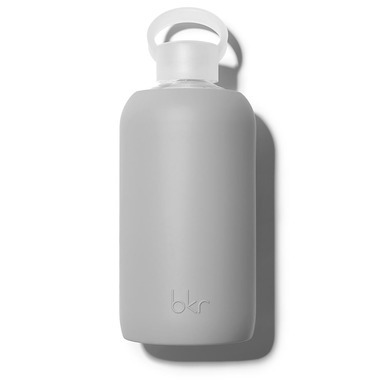 My husband and I both bought the BKR 1 litre bottles! The silicone is easy to take off and put back on! My husbands lid cracked within the first few days of using it but he contacted bkr and they sent him a new one right away! Great bottle and I recomend it.